Recently we learned that Shutters at Disney’s Caribbean Beach Resort would be renamed as Sebastian’s Bistro. (You know, after the crab from The Little Mermaid.) Now, we know when you’ll be able to begin dining here! October 8 is the day! 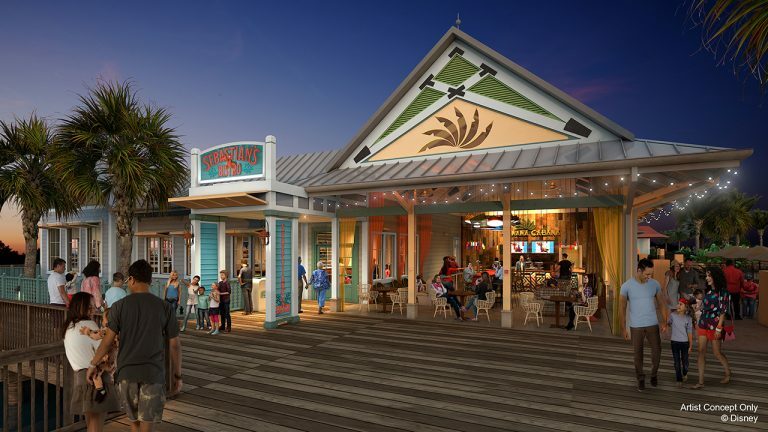 This casual table service restaurant will feature a menu that blends Latin and Caribbean flavors with market-fresh ingredients served up with warm island hospitality and waterfront views. Appetizers will include Caribbean Pull-Apart Rolls (served with guava butter, mango chutney, and Jamaican jerk oil); Jamaican Meat Pies with Guajillo chili sauce; or Arepas with slow-cooked pork and chili-mango barbecue sauce. For entrees, you can choose from Skirt Steak “Chimichurri” with crispy yuca; Citrus-Stuffed Sustainable Whole Fish with turmeric brown rice and cilantro-lime vinaigrette; Sautéed Shrimp and Tamales with sautéed peppers and salsa verde; a Crab Cake-topped Burger with lettuce, tomato, and horseradish mayonnaise; a Crispy Avocado Bacon Burger with chimichurri and pico de gallo; and the Island Curry “Eggless” Sandwich served on multigrain bread and the Plant-Based Bahn Mi Sandwich with cucumbers, pickled vegetables, and Miso-Sriracha mayonnaise. Let’s not forget dessert! Enjoy Mile Marker Zero which features Iced Key Lime Pops with sea salt and tropical sauce; Banoffee Pie with banana custard and chocolate ganache served in a graham cracker tart with caramel sauce; and Floating Island Sundae with fresh Caribbean fruit, meringue, guava, and Guanabana sorbet. But that’s not all! It appears that Old Port Royale will fully open on October 8, as well! That means Guests will be able to soon dine at the quick service location, Centertown Market. 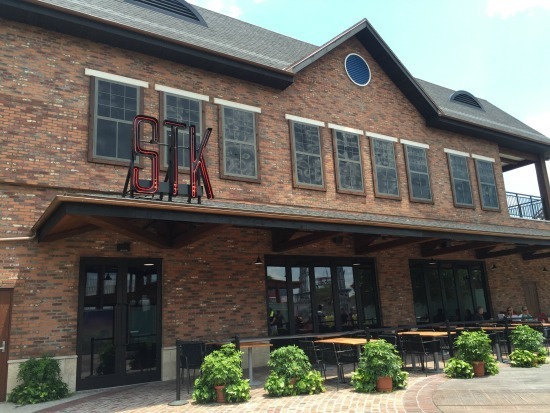 This restaurant has been expanded and reimagined as an indoor street market. The new menu at Centertown Market will include a combination of family-friendly fast casual offerings mixed with customizable Latin and Caribbean-inspired dishes. One of the highlights of the menu is the new Island Bowl available for breakfast and dinner. (Where have I heard about these before…..hello Pandora!) These bowls can be customized with your choice of base, protein, sauce, and if you’re ordering a breakfast bowl, you can even choose what kind of egg you want on top (scrambled, poached, or tofu scramble). Bases include red beans and rice (offered all day), home fries (for breakfast), and greens (for dinner). For proteins, choose between rotisserie beef, bacon, chorizo, or plant-based sausage for breakfast and rotisserie beef, pork shoulder, banana leaf-wrapped fish, jerk chicken thighs, or vegan chipotle seitan for dinner! Breakfast sauce options include salsa verde or pico de gallo, while the dinner sauces include chimichurri, garlic ranch, or spicy pink sauce. I’m excited to try these, as they sound delicious! There will also be more traditional menu items. For breakfast, enjoy Eggs Benedict; th All American Breakfast Platter with eggs, home fries, sausage, bacon, and toast; Coconut Waffles with fresh fruit; Banana Pancakes topped with granola and pineapple chunks and served with sausage and maple syrup. Dinner will include things like fresh salads, Sicilian-style pizza, pasta dishes, and a variety of sandwiches and burgers. Kids will be able to eat Pirate Mickey Waffles and French Toast or the Egg Popper for breakfast (a hard-boiled egg pop with green pirate juice, roasted pineapple, and bacon). For dinner, there will be Chicken Breast Nuggets, Tacos, Beef and Mushroom-blended Cheeseburger, and Grilled Cheese for dinner. If you’ll be lounging by the pool, enjoy the pool-side bar, Banana Cabana! Here there will be exclusive cocktails made with premium spirits and Caribbean seafood and mainland dishes. Also reopening at this time will be the shop, the Calypso Trading Post, as well as a new front desk and concierge area. Finally, a change to the island names will occur. Trinidad North will become Barbados and Trinidad South will become, simply, Trinidad. Looks like things are finally starting to change for the better at Disney’s Caribbean Beach Resort, as these changes will definitely enhance the current experience for those who have vacations schedule here soon. I’m so glad to hear this. We’re going to be there at the beginning of November, and I was worried that Centertown and the gift shop weren’t going to be done yet!